Quote: "They don't call it the internet anymore, they call it cloud computing. I'm no longer resisting the name. Call it what you want." Larry Ellison, full name Lawrence Joseph Ellison, dropped out of two different universities (Illinois and Chicago) before he co-founded Oracle in 1977 (or Software Development Laboratories as it was initially known back then), taking the role of CEO right through until the autumn of 2014. There aren't many tech companies out there, let alone major firms, that have the same chief exec for 37 years, and indeed Ellison is Silicon Valley's longest reigning CEO ever – a huge achievement in itself – though his relinquishment of the role, when it finally came last September, didn't see him retire from the business. 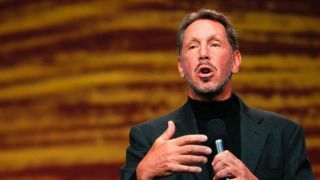 He merely stepped down to become Executive Chairman and CTO of Oracle. Oracle's success under his leadership has been phenomenal, with the firm's core database product driving it forward to become the second biggest software giant in the world, with a revenue of $38.2 billion (around £24.3 billion, or AU$47.8 billion) in fiscal 2014, which was second only to Microsoft. That's perhaps only eclipsed by Ellison's personal fortune, with his net worth standing at a staggering $54.6 billion (around £34.7 billion, or AU$68.3 billion) according to Forbes. That makes him the fifth richest person on the planet, and the second richest tech tycoon behind Bill Gates. Perhaps unsurprisingly Ellison attacks his personal life with gusto, too, and is a qualified pilot with a big plane collection, plus he races yachts. In his current Executive Chairman and CTO role, he still has a hand in tech development, product engineering and Oracle's overall strategy, which a few see as the Apple of Enterprises.